Since it first arrived at Singletrack Towers back in October, I’ve had the pleasure of riding the absolute pants off a 2017 Whyte T-130s longterm test bike. It’s been an absolute ripping ride that’s surprised me with just how capable this tough little trail bike really is. Outside of our testing, the T-130 has clearly been a thoroughly popular bike for 2017, having been a regular sight at almost every trail centre and mountain bike race that we’ve been to over the past 12 months. Widespread demand caught Whyte somewhat by surprise, and the company has been working overtime on increasing supply to meet that demand. 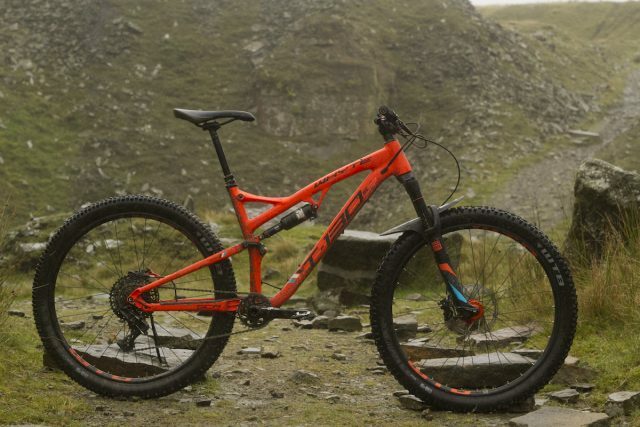 Contributing to that demand, the Whyte T-130 has been notching up superb reviews all over. 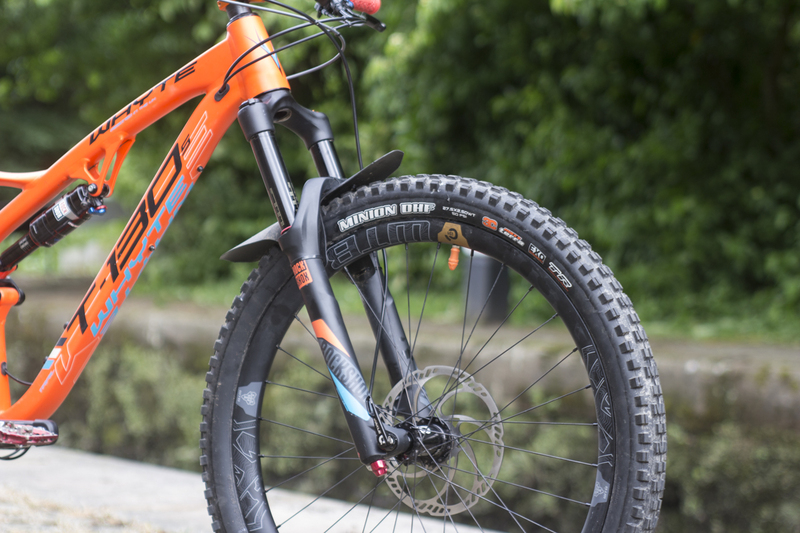 It won itself the coveted Singletrack Reader Award for “Best Bike Under £2500”, and if you’ve already read my review of the 2017 Whyte T-130s, you’ll also know that it’s earned a Singletrack Recommended stamp of approval too. The 2017 Whyte T-130s in stock form. The matte-mango machine first started out as a stock 2017 T-130s, which I tested and reviewed for Issue #111 of Singletrack Magazine. As part of the updated T-130 range for 2017, the T-130s is one step up from the entry-point into the 27.5in-wheeled, 130mm travel trail bike model line. 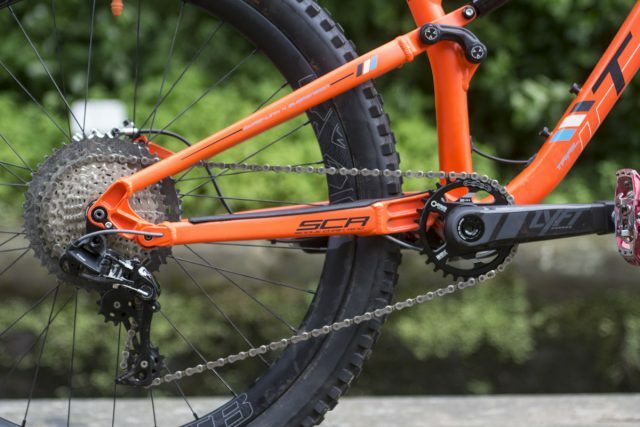 The T-130s uses an alloy frame and an almost exclusively SRAM/RockShox build that nails almost every “must-have” feature for a modern trail bike. 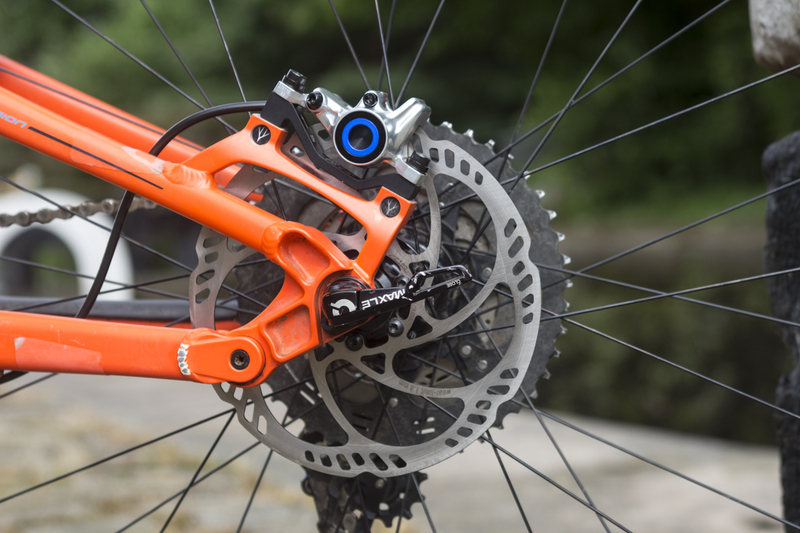 There’s a 1×11 drivetrain for the 1x specific frame, Boost hub spacing, wide rims, tubeless tyres, and an internally routed dropper post, while the frame features a compact chainstay length combined with a long front centre to give you the nimbleness where you want it, and the stability where you need it. The result is an excellent all-round ride quality that balances agility, straight-line speed, traction, suppleness, and feedback. As part of the longterm test process, I’ve been using the T-130s as a platform for testing and reviewing numerous other bits and pieces, including wheels, tyres, cockpit items, drivetrain components and disc brakes. 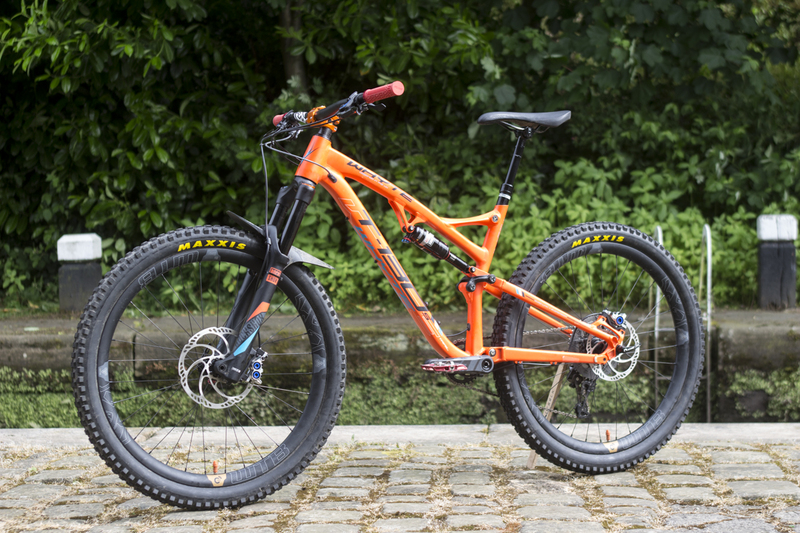 It’s had loads of gear bolted onto it for evaluation, including the Box Components PushPush 1×11 shifter and derailleur, and a slew of suspension forks as part of our trail fork group test. More recently, the bike has had a full rebuild. Before the bike hits the trails again for another solid few months of testing, we whipped out the camera to nab some shots of the T-130 in its rarely seen clean state, to give you a look at some of the changes I’ve made to it. The stock cockpit on the T-130s is one of the reasons the bike rides so well and feels comfortable straight away. Whyte has designed the T-130 frames with longer top tubes across each size in the range to help increase the Reach measurement, and therefore to stretch out the bike’s front centre. To keep the actual reach the same however, Whyte runs a short 45mm stem on each frame size, so the bars don’t end up way out over the front wheel. Although I wasn’t unhappy with the 45mm stem length and 760mm bar width, I was keen to try a slightly wider bar and shorter stem to see if I could improve the front end of the T-130s – or whether I’d simply ruin it instead. 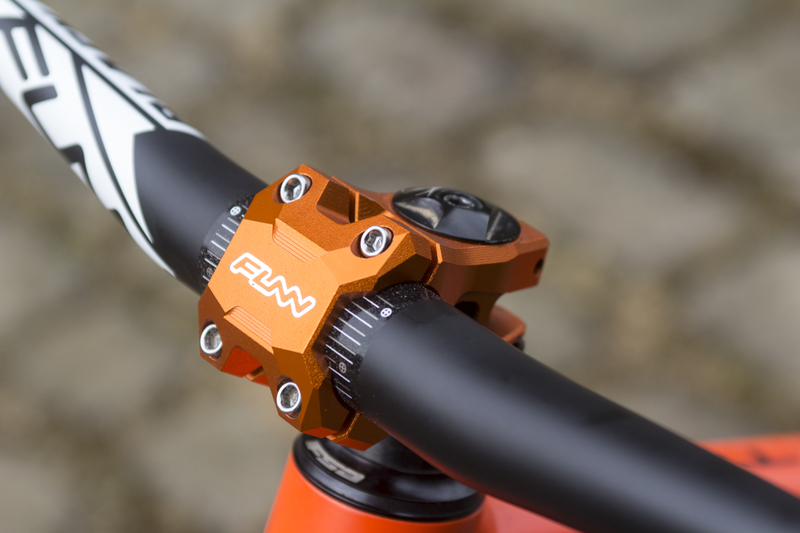 Anodized orange Strippa EVO stem from Funn. Sub-200g carbon bars from Funn. The reason I went shorter on the stem length was because of the move to a wider handlebar, and the increased reach that creates by splaying your arms out wider. 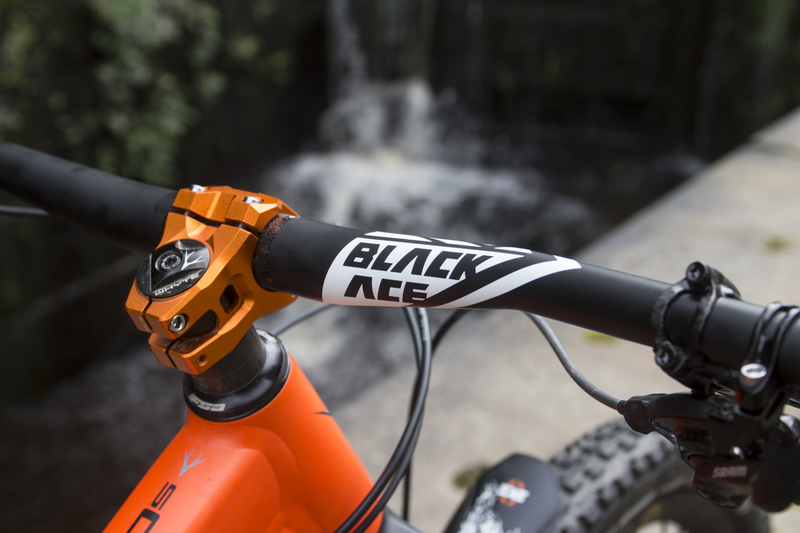 This is the new Black Ace carbon handlebar, which replaces the stock alloy Whyte bar. Weight is 195g on our Park Tools digital scales (1g lighter than claimed), and that’s impressive for a downhill-worthy 785mm wide bar. Funn is pretty amped on these bars and the way they’re made. Unlike loads of other carbon handlebars, there is no seam for the unidirectional carbon fibre tube, though Funn is being pretty tight-lipped on how it does that. Rise is 15mm (also available in 30mm and 7mm rise), and sweep sits at 5.5° up and 8° back. Thin lock-on grips by Funn with a single locking clamp. For matchy-matchy purposes, I’ve got a new set of Funn Hilt lock-on grips. Unfortunately in non-matching red (I know – WHAT WAS I THINKING?? ), these use a single lock-on clamp on the inboard end of the grips with a 2.5mm hex key locking them down. Nice and thin with a slight raised edge on the outer part of the grip. Magura’s MT Trail Carbon brakes feature carbotecture lever bodies, with carbon fibre lever blades. Exotica. 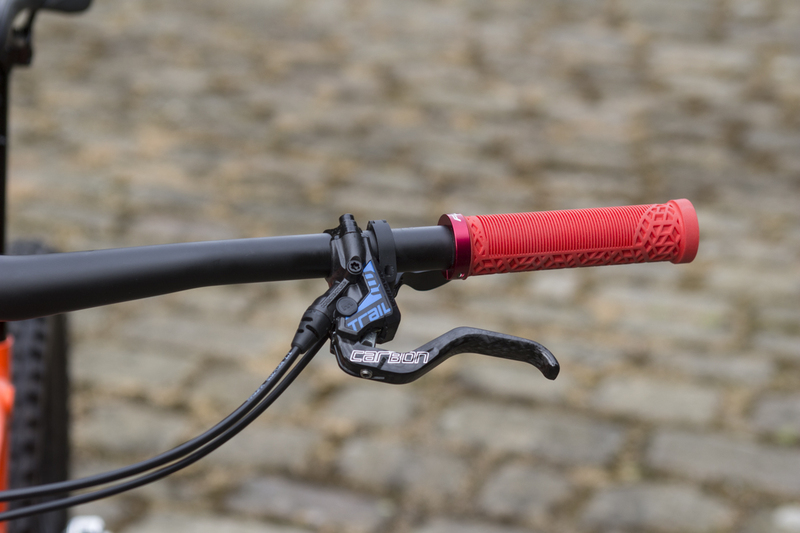 The MT Trail Carbon brake straddles the performance and weight between the MT7 and MT8 brakes from Magura. With a hydraulic disc brake test on the horizon, we’ve got a few disc brakes coming through the office for testing as we speak. 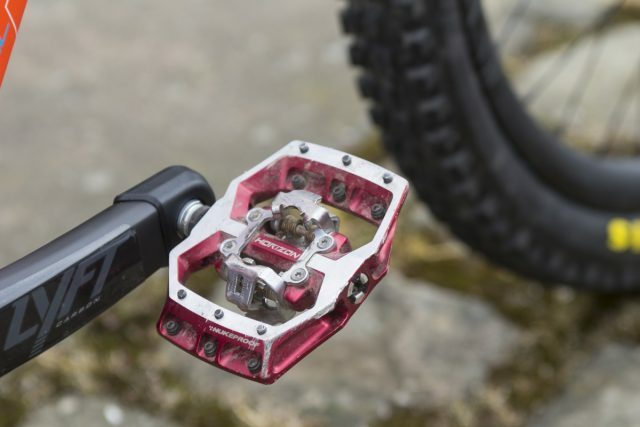 One such set is the latest MT Trail stoppers from German hydraulics expert, Magura. 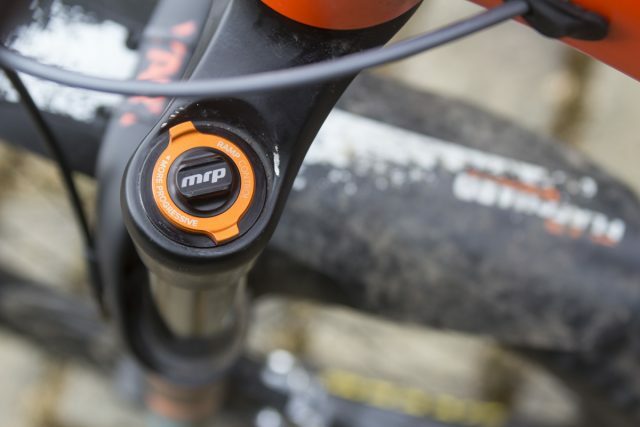 The MT Trail Carbon brake sits in between the MT7 and MT8 brakes in the Magura range, with the goal of combining the lightweight and modulation of the MT8s, with the raw eyeball-popping power of the MT7s. Four pistons, four pads, and 200mm rotor for mega power up front. Two pistons, two pads, and a 180mm rotor for increased modulation out back. With most of the braking force required on the front, Magura has spec’d the MT Trail brake set with a twin-piston calliper out back. With less power than the 4-pot calliper on the front, the idea is to allow the rider to use equal hand force at the lever, which delivers more braking power for the front wheel, and slightly less at the back so you reduce the chance of locking up the rear tyre. It’s an interesting concept, and I’ll be giving these a good ol’ scrubbing over the coming months to see how well they perform. In terms of weight, the rear brake with the 180mm rotor pictured weighs 364g, while the front brake with 200mm rotor clocked in at 413g on our digital scales. 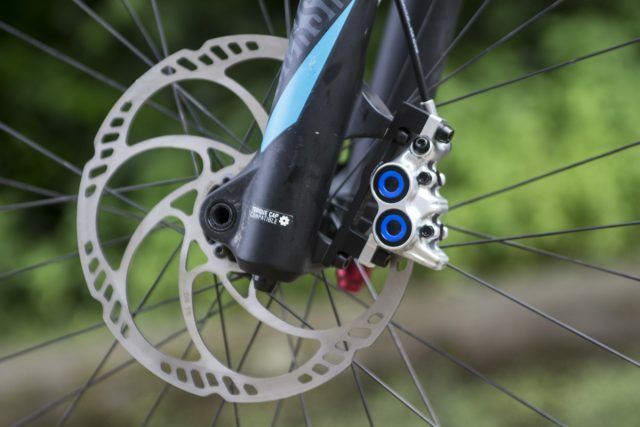 Oh, and as an FYI, Magura has also recently released a cheaper non-carbon version of the MT Trail brakes. 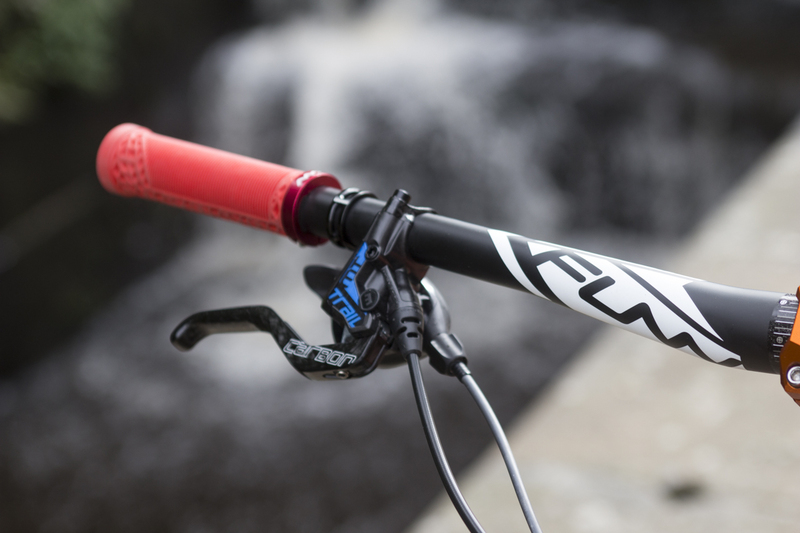 PRO’s first dropper post; the 120mm travel Koryak. Single-chainring specific back end on the T-130s. 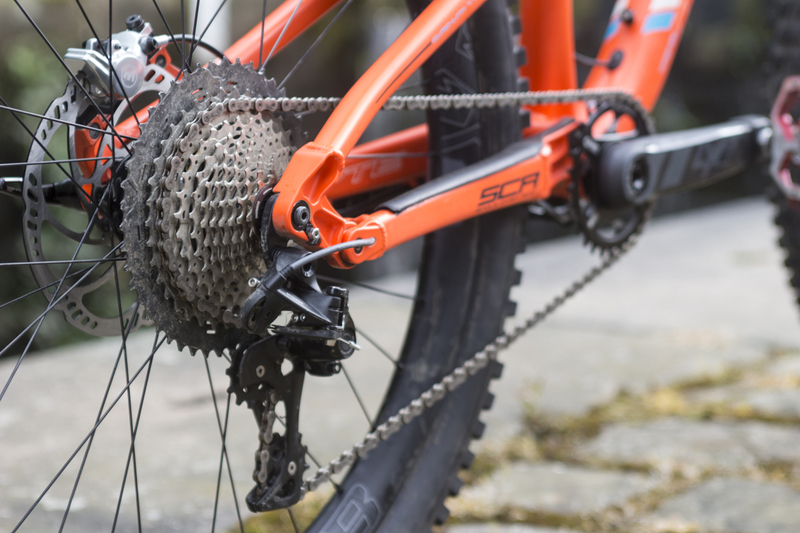 The drivetrain on the Whyte T-130s has also had plenty of chopping and changing over the test period, with the the low-end of the gearing range having opened up thanks to Shimano 11-46t cassette. There’s also been a few different pedals been tested on the bike, including those new Funn Mamba pedals we featured recently. Horizon CL pedals from UK brand Nukeproof. Right now, I’ve got a set of Nukeproof Horizon CL pedals bolted onto the T-130’s cranks. The Horizon pedals are available in two different platform sizes, with the CL being the Large size, and the CS being the Small. I’ve got both on test for an upcoming platform SPD pedal test, so we’ll keep you updated on our test results there. The Nukeproof Horizon CL & CS pedals use a Shimano SPD-compatible mechanism, so they’ll work with existing Shimano cleats. They also use removable pins, so you can play around with grip levels between your shoe and pedal body. After months of waiting, the Lyft Carbon cranks are finally here. Some fresh cranks from Praxis Works, in the form of its new lightweight Lyft Carbon crankset. 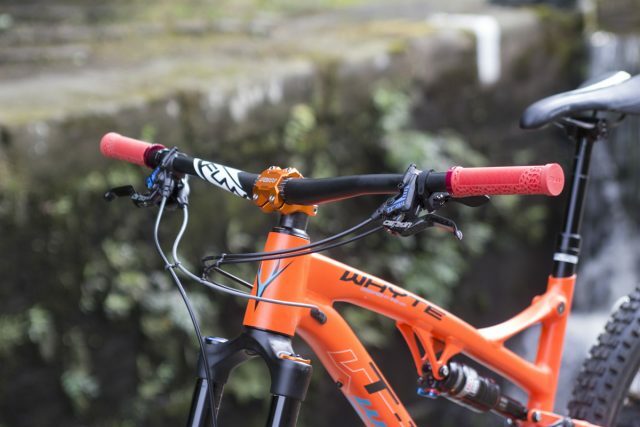 Chipps got the latest scoop on the Lyft Carbon cranks when he caught up with Praxis Works at Sea Otter for those who want the full spec run down. 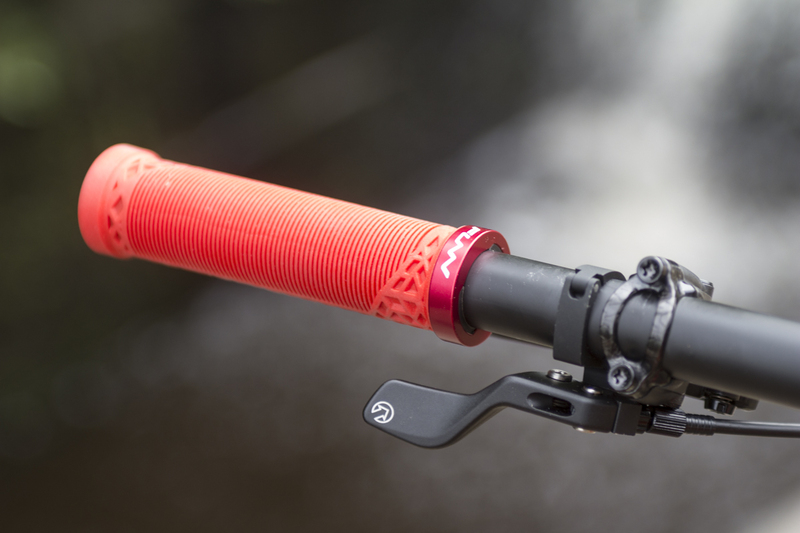 And after receiving them just a couple of weeks ago, you can also check out our video on the Praxis Lyft Carbon cranks here. 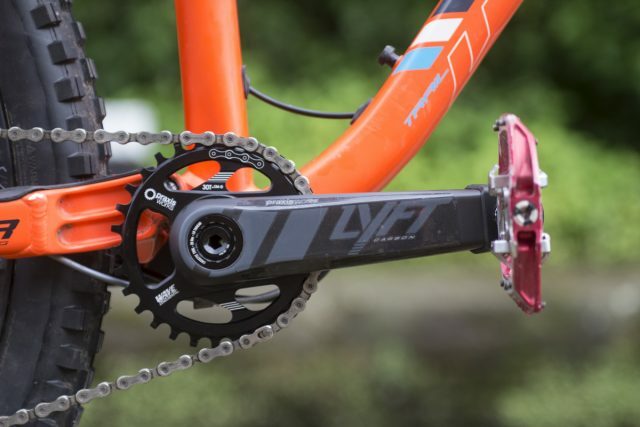 For those who want the short version, basically all you need to know is that they’re carbon, use a 30mm diameter spindle, and feature a direct-mount chainring that employs the MRP Wave Tooth profile for secure chain retention. Sub-500g weight makes these some of the lightest on the market. The cranks are available in 170mm and 175mm arm lengths, and you can get chainring sizes from 28t through to 36t. I’ve got a 170mm Lyft Carbon crank to test, and it’s setup with a 30t Boost offset chainring. 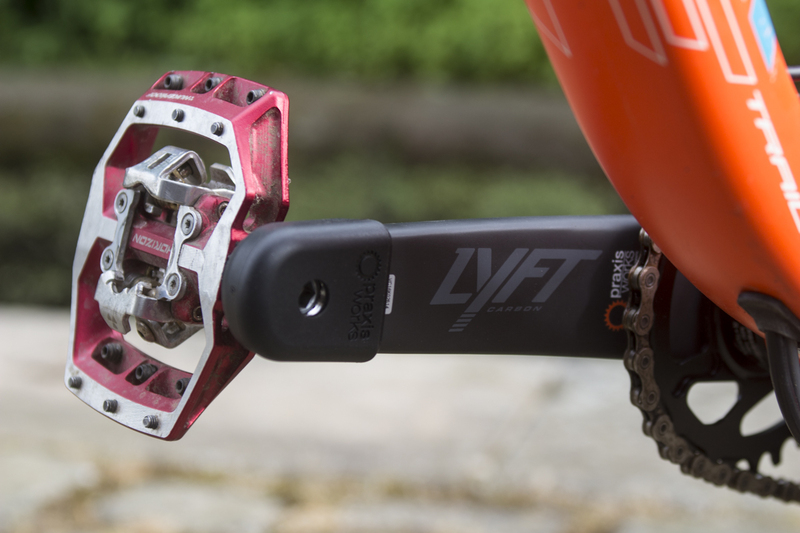 Including those rubber crank boots, the Lyft Carbon cranks come out to 461g including the chainring. To match the Whyte T-130’s 73mm threaded bottom bracket shell, I’ve also got a Praxis Works M30 BB to keep things rolling. There’s been plenty of anticipation on these new cranks, so I’m keen to see how they go durability wise, as in terms of weight, they’re right up there with the superlight Race Face Next SL cranks. Moar gears! 11-speed XT cassette out back with 11-46t ratio. Chunky carbon wheels from WTB. Also tested and reviewed for Singletrack Magazine is this set of WTB Ci31 carbon wheels. Built around an Industry Nine hubset, the Ci31 rims are made from UD carbon fibre and feature a deep profile with a 31mm internal rim width, making them ideal for the new Wide Trail 2.5-2.6in tyres. With a 3-cross 32x spoke build, the chunky carbon wheels are mega stiff, which suits the plush suspension on the T-130s well. It also gives the whole bike a really chunky appearance, which I’m quite into. 2.5in wide Minion DHF tyres from Maxxis. 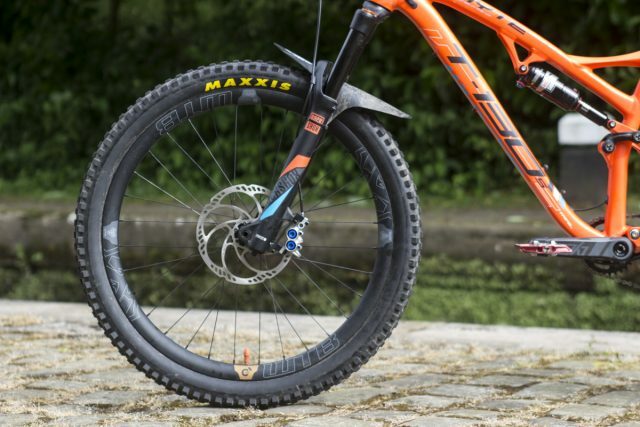 Paired up to those wide WTB Ci31 carbon rims is a pair of Maxxis Minion DHF tyres. I’ve run loads of different tyres on the Whyte T-130s, but right now I’m rocking the Minion DHF treads for the slightly drier trail conditions that we’ve got at the moment (it’s going to pour down with rain now isn’t it?). 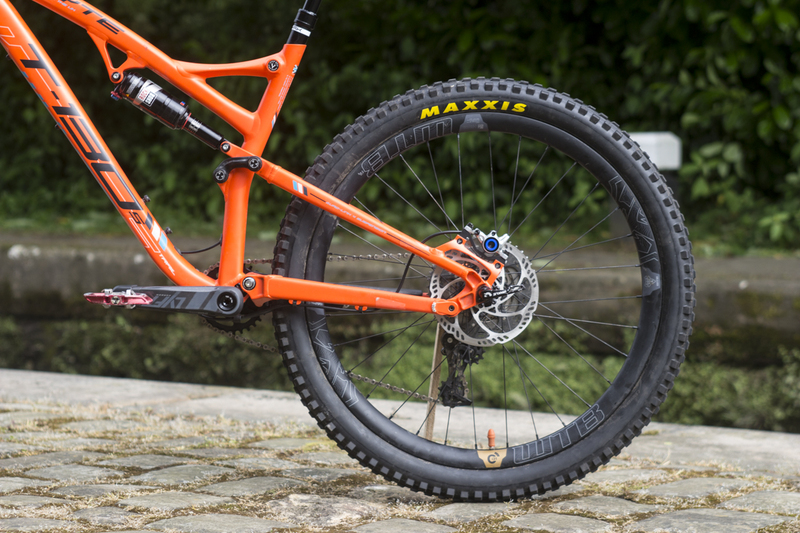 They’re the 27.5in diameter versions in a 2.5in ‘Wide Trail’ width that’s ideally suited to modern wide rims. Although these tyres are available in cheaper rubber compounds, we’ve got the top-dog version that uses a 3C triple rubber compound and EXO reinforced sidewalls. Keep your eyes on singletrackworld.com for the review on these. 130mm travel RockShox Yari RC fork has been an excellent performer. 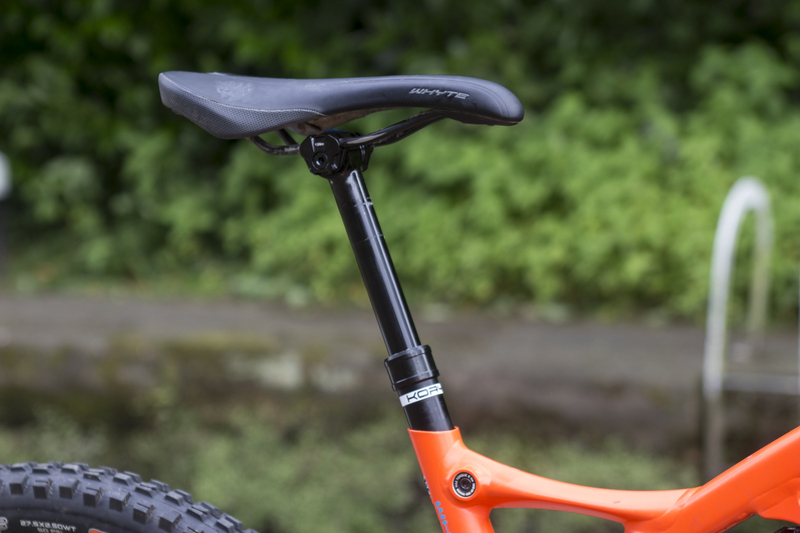 As the cheaper version of the Lyrik, the Yari fork has proved to be a brilliant performer in my time with it – both on the T-130s and on other trail bikes. It’s slippery sliding is a great match for the supple suspension out back, and the stout 35mm stanchions and magnesium lowers help to deliver a very tough feel at the handlebars. For my 70kg riding weight, I’ve ended up settling on about 63psi inside the Solo Air spring. I’ve played around with Bottomless Tokens, but after having pulled one out to decrease progression, I ended up going back to three tokens, and it’s pretty much bang-on for me. More adjustability of the spring rate via the MRP Ramp Control upgrade. So as it stands, that’s where the T-130s longterm test bike is currently at. Keep your eyes locked onto the website for upcoming reviews of each component being tested aboard the T-130s, and I’ll have a final review on the bike itself coming atcha in the near future too. 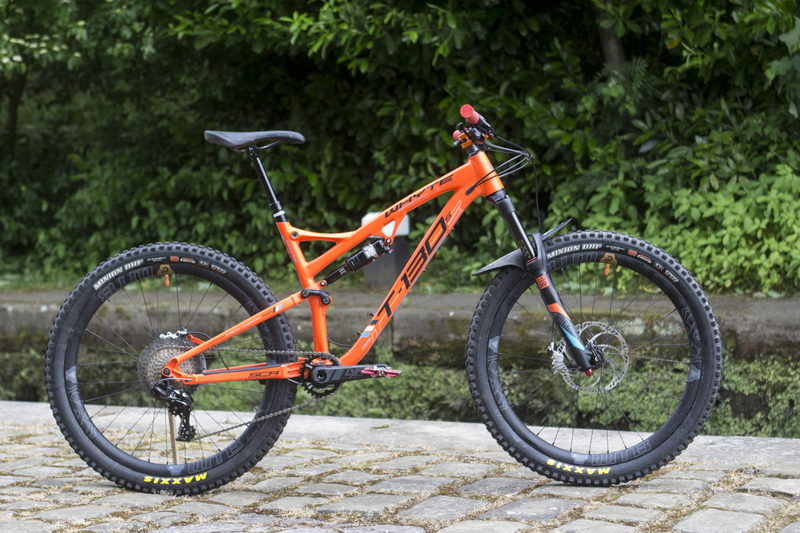 What more details on the T-130s and the rest of the Whyte range? 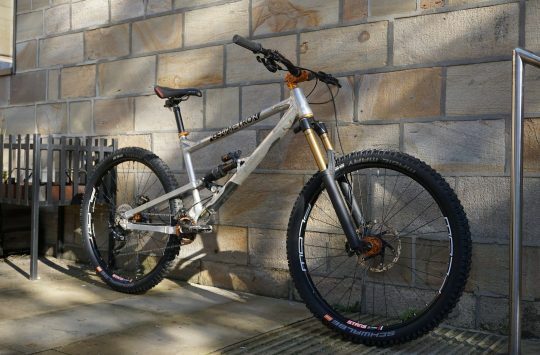 Then head over to the Whyte Bike website for more. Wil, what happened to your review of pressure gauges that was mentioned some weeks ago? Did I miss it? @Leadfold – not at all mate, but will have a feature for you to read soon! Was there a particular gauge that you were interested in? Wil, I am looking for a light weight accurate gauge to carry with me when riding. Be nice too if it wasn’t heart-stoppingly expensive. Not a worry @Leadfold – we’ll have some useful information for you in the very near future mate! That’s a LOT of upgrades, why not just buy the higher end bike to start with ? Interesting though. How much weight have you saved on the build ? You don’t really say much about the effect the changes have had ? 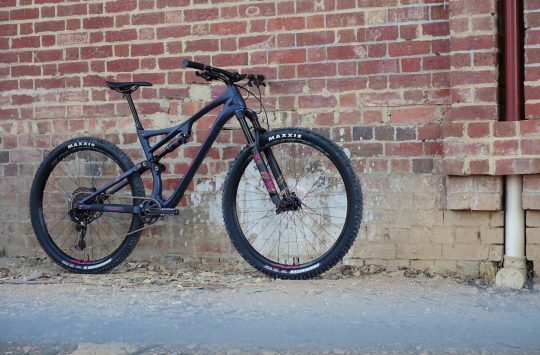 @weeksy – the Whyte T-130 is a long term test bike, so aside from testing and reviewing it in stock form, it’s also being used as a mule to test and review other parts and components. The article you’ve just read is simply an update of some of the parts currently being tested on the bike. And as I mentioned in the article, you’ll be able to read the full reviews of those parts and a final feature on the bike the near future – stay tuned! Hi Will, how do you find the Maxxis DHF’s vs the stock WTB rubber? I’m taking my T130s to the Alps in August and have been considering running tougher rubber than the lightweight stock WTB tires. Zero complaints on the Minion DHF tyres – very sticky and the 2.5in WT size is well suited to the wide rims that come stock on the T-130s. 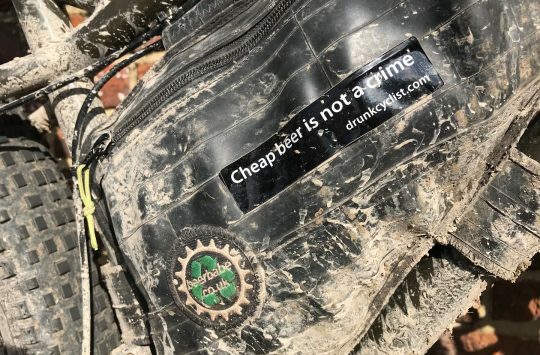 They’re not great for wet and gloopy conditions (the DHR II or Shorty is your friend there), but they’re brilliant for everything else, and if your alpine trails will be mostly dry and rocky, you’d be hard pressed to get a better tyre than the Minion. That said, the WTB Vigilante is an excellent tyre also, just a little slower than the Minion DHF but grippier in the loose stuff. The weight is almost identical (937g for the Minion and 932g for the Vigilante) and it also sizes up very similar to the 2.5in WT Maxxis. @sillyoldman – thank you for the pickup! Seems we were given a bum steer with an earlier price… Article amended with the correct price now!